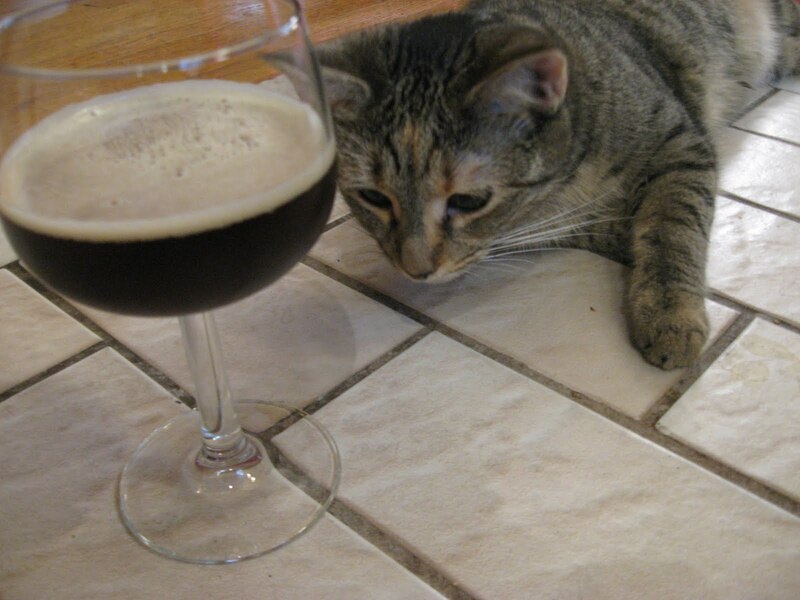 A day before celebrating our independence from Europe, our cat Dame Maggie Smith decided to pay her respects to our Euro-friends by brewing up a Belgian-style dubbel ale, just to be contrarian. One of our mentors suggested that Mrs. Quail and I seem to be trying to turn our cats into Lolcats, but really, that's impossible. Our cats are not funny at all (except for Professor Moriarty. He's hilarious. But also quite possibly evil, so it's a bit awkward deciding whether to laugh at him.) We assure you, Maggie is all business as the new brewmistress of Ducksmack Ales. See for yourself! 1. This is a Smack Pack. You smack it to release yeast nutrients into the yeast. I don't think Maggie knows this; she just smacked it as a matter of course. Then she smacked me a little for good measure. Then Professor Moriarty smacked her, then she smacked him, and then we all had a good laugh. 2. 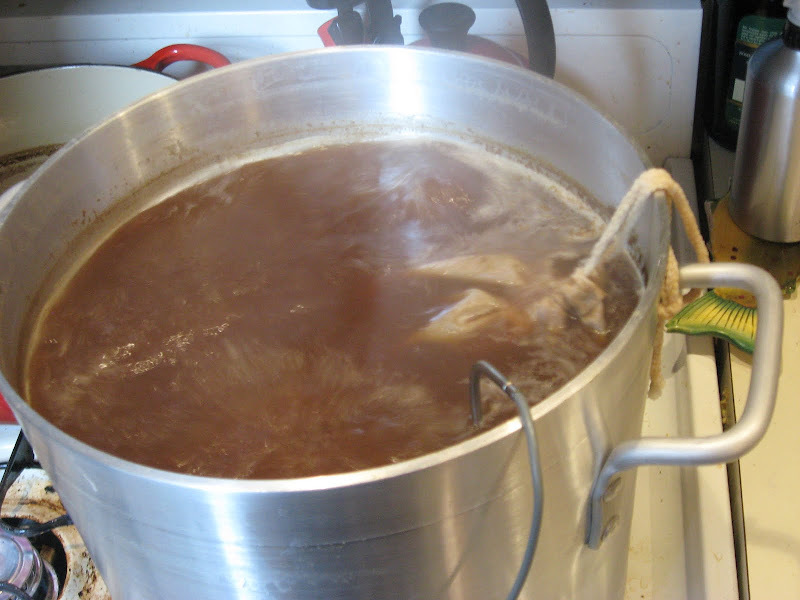 She gathered a few ingredients courtesy of Brooklyn Homebrew. 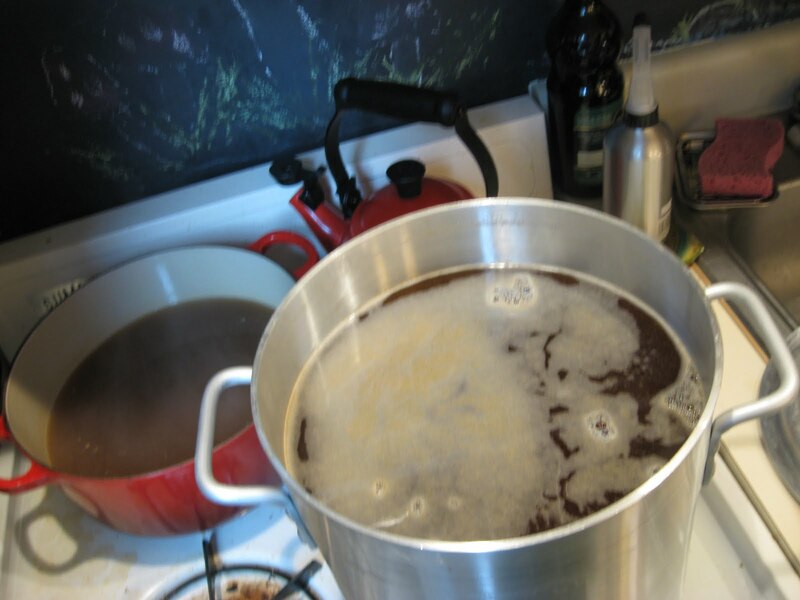 In addition to the yeast shown here (taken from the Rochefort Trappist strain, last seen in this post) and the malted barley not shown, she used Belgian Dark Candi Sugar, turbinado sugar, Hallertau hops (with the painter's tape) and Styrian Goldings hops (without). 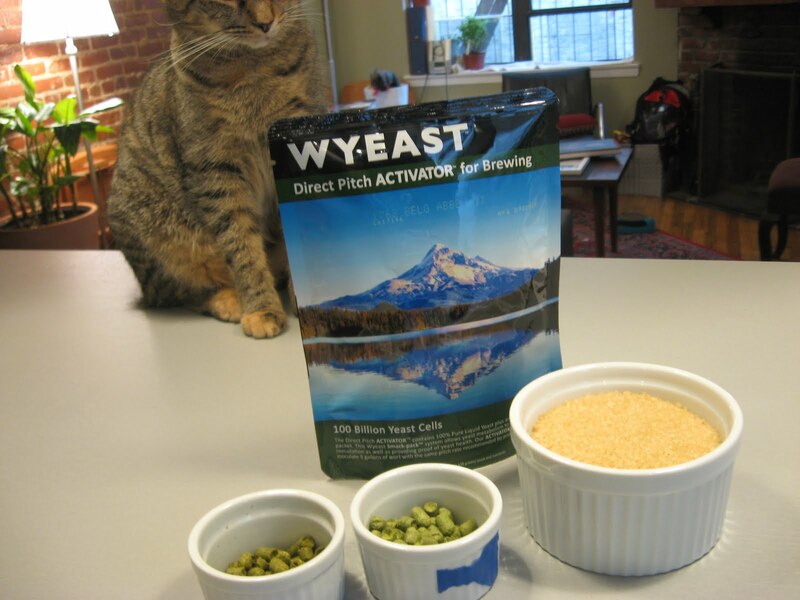 She kept her distance here, instinctively aware that some people say hops are toxic to some animals. Stay away! That's probably one reason why she chose to make a less-hoppy beer like a dubbel. 3. Your one and only view of the grain as it is steeping. This is called the mash. It smells like hot Grape-Nuts. It is overfull. 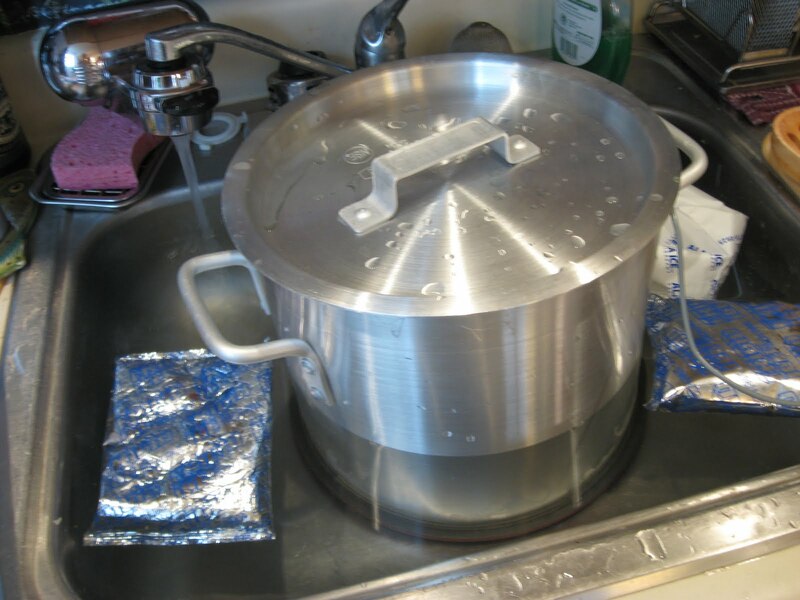 I know this because it overflowed just slightly onto the stove when that cover went on, making for some challenging clean-up (Dame Maggie refuses to clean, so guess who had to step in...) Inside the grain bag is Belgian Pilsner, Belgian Caramunich, and Belgian Special B malted barley. I wish I'd taken a photo of Maggie with her big mash paddle, but when I tried, she used it to knock the camera into my forehead. 4. 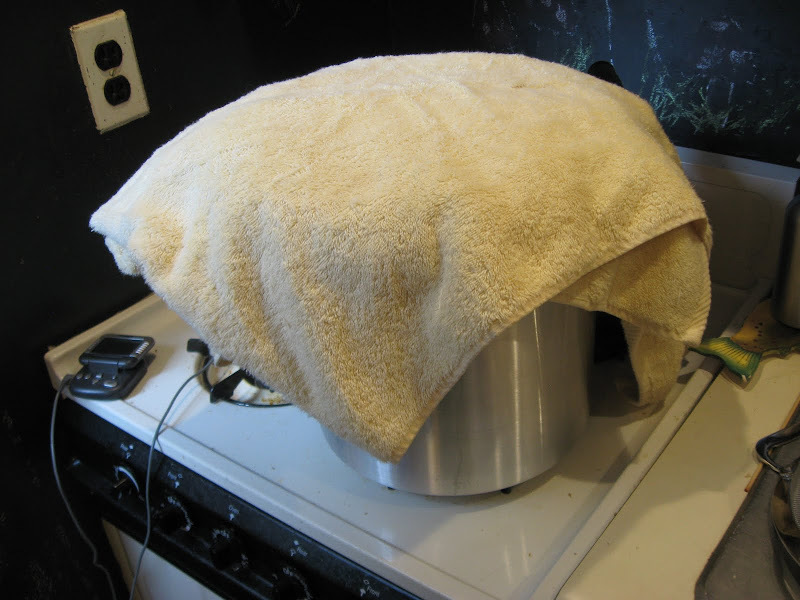 The mash had to stay at 150 degrees for an hour, which I said was impossible, but Maggie has her methods. 5. 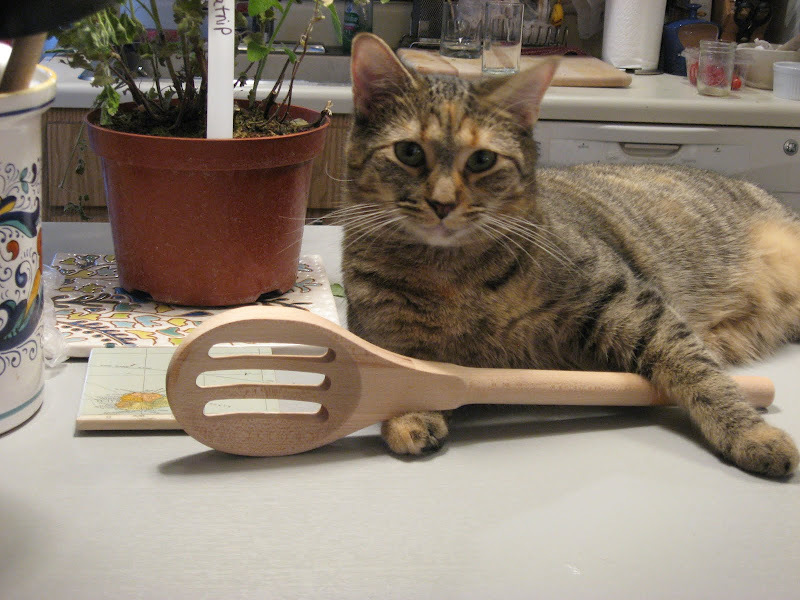 I didn't feel so much like helping until she showed me how I was being selfish, by clawing me. 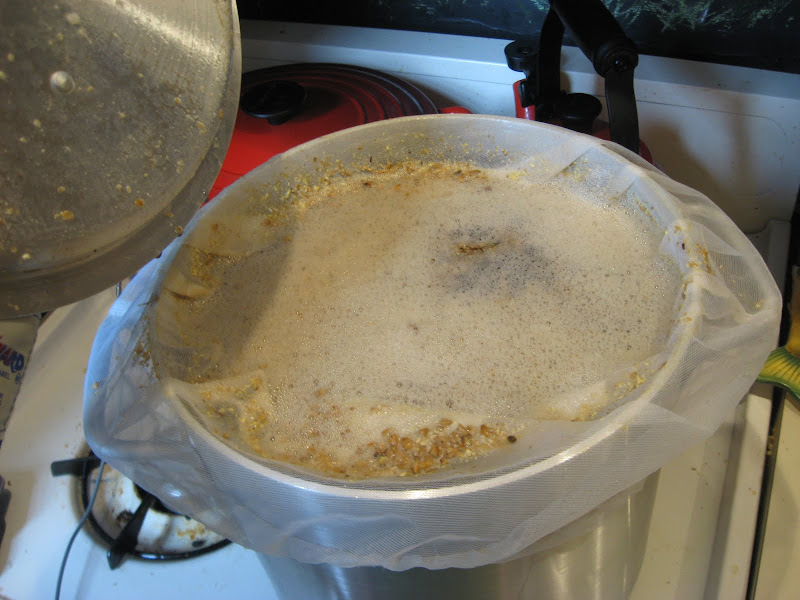 Here I'm performing part of "the sparge" by lifting up the grain bag and letting it drip down into the kettle. I then dipped the grain bag into a second kettle full of water (aka the little red Le Creuset hiding behind there) and squeezed it a bit to get all the residual sugars out. 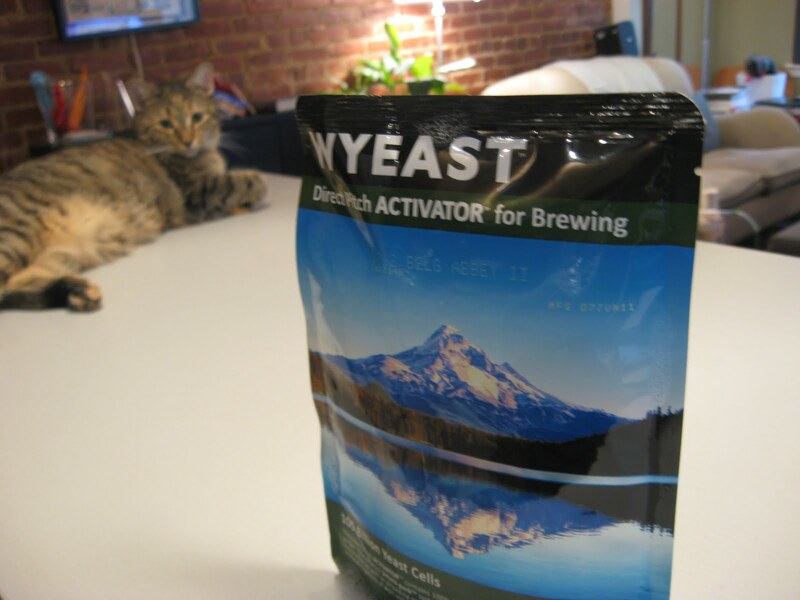 Some people think this can make a beer tannic, but I like living dangerously, and besides, it's for the cat. 8. 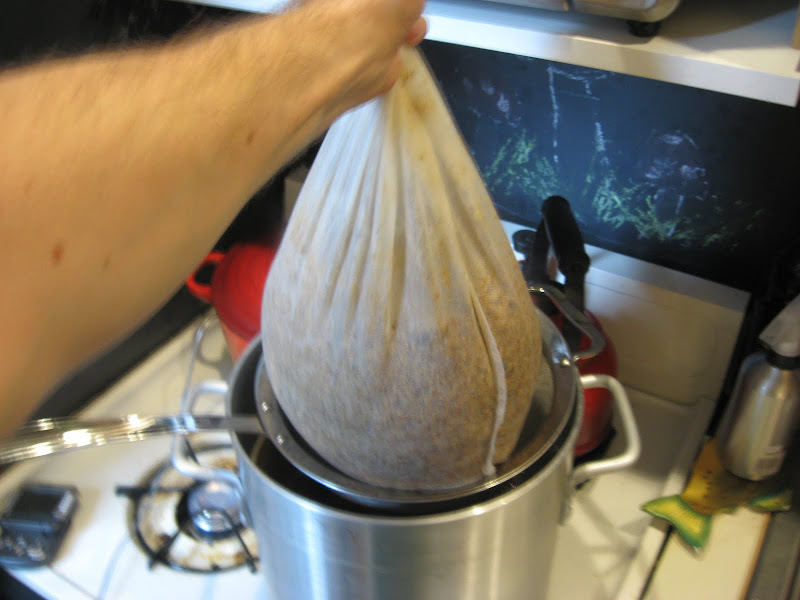 During the boil, she added hops in a hop bag. You have not lived until you've seen a cat tie a drawstring. Or jet-ski. 9. I mercilessly teased her for using such a low-rent chilling method. So she clawed me. 10. Here she be: Ducksmack Ruddy, three days in. This is a new 3 gallon carboy made of plastic so as to mitigate the risk of impaling oneself on shards of pointy glass. 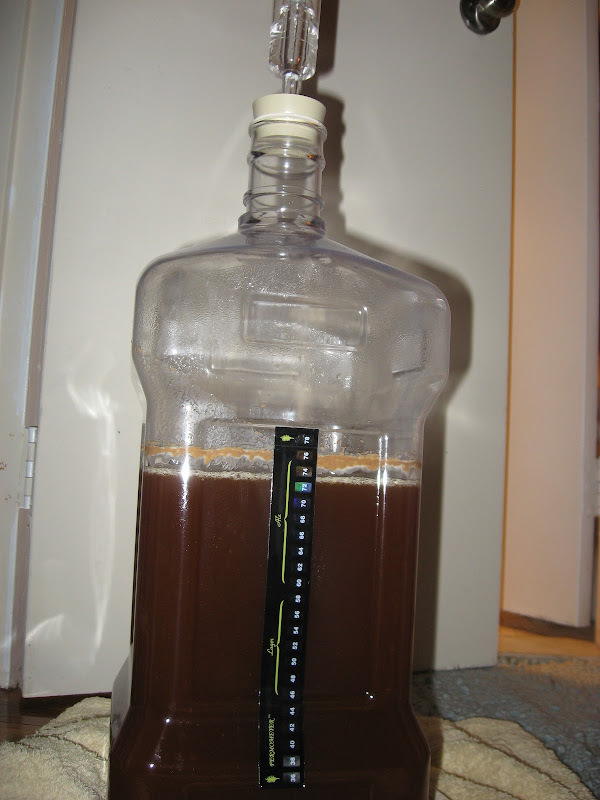 It's only about 2 gallons, because that's what our system allows. Maggie says she might take a gallon out and add cherries to it. I think she's nuts. Although steeping cherry pits can generate arsenic, so it's highly possible that this has all been the start of some diabolical ruse orchestrated by Professor Moriarty. At any rate, this'll be ready around mid-August or early September. Maybe some will still be around for Thanksgiving. Op uw gezondheid! DO NOT QUESTION MY METHODS!! !